AppliCad roof software is the world’s best selling software for metal roof estimating. Model your roof and walls in 3D because it provides verifiable accuracy of estimates. 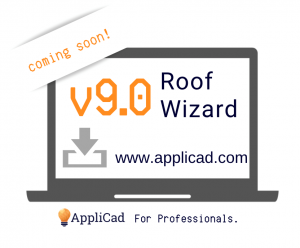 Roof Wizard Software – FREE! Designed for your phone or tablet! Really busy? Short staffed? If you need help to get to the bottom of your in-tray, let our master modelling team help. Jobs late? Consider it done! The AppliCad process of modelling in 3D provides you with total confidence in the final result. The model is the job – if it checks correct, then it is. The process is reproducible, meaning that regardless who completes the job the result will be the same, providing total accuracy of output, for all your work. Creating your 3D model from a PDF, aerial image or field measurements is quick and easy. With most modelling functions totally automatic – a single mouse click away. You can turn a request for quotation around quickly, efficiently and accurately – confident that it is correct. Modelling your roof in 3D and simulating the installation of all your roof materials is like a dress rehearsal for your complete project. You know it will be OK on the day because you have ‘rehearsed it’ on your roof software model – all options can be explored without incurring additional expense. AppliCad relentlessly pursues the best way for you to work, investing heavily in research and development and works closely with all our customers around the world, in 148 countries – everyone has something to contribute to the process of roof software improvement. AppliCad Roof Wizard is suited to any commercial, industrial or residential roofing or cladding project and provides the most accurate 3D roof and wall modelling and measurement functionality. The advanced tools generate detailed reports featuring complete material lists of everything for your job including all trim, fascia, gutter and downspouts, labour summaries, roof geometry such as pitch, length and area reports that substantially increase your professionalism, profitability and efficiency. AppliCad provides detailed, accurate reports from architect’s PDFs, aerial imagery and hand drawn sketches. Read more about the new Roof Wizard with Solar Wizard tools or try it for yourself. All users of AppliCad software benefit from one of the most complete programs in the industry, and have the confidence of knowing that they are fully supported. Knowing that the guys behind this have decades of experience between them – to support you. AppliCad roof software automates manual processes and provides the most accurate 3D roof and wall modelling and measurement functionality for manufacturers, distributors and contractors. Our Roof Wizard roof software enables you to get more done, in less time, with greater accuracy and with the highest quality client proposals – in the office, on the road or on site. Roof Estimating Software that Works!